Only the other day, a friend (and regular commenter here in Clockwatching… towers) recommended that I try reading something out of my ‘comfort zone’ in order to stimulate my creativity. He was, of course, entirely right. Perhaps something of his wisdom had already started to permeate my brain, because last week – slithered in among all the other things I was managing to do – I read a book that I will never forget. 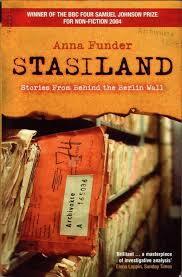 That book is Stasiland: Stories from Behind the Berlin Wall, by Anna Funder. Originally published in 2003, Stasiland is a monumental work of research into life in Germany during the Stasi regime, which began shortly after the Second World War and lasted until November 1989 with the fall of the Berlin Wall. Funder (who is Australian, and began her book while working in Germany during the 1990s) explores not only the stifling, claustrophobic terror of life in east Germany during this time, but also the many reasons for the development of such an ‘under siege’ mindset among the Stasi’s high officials, some of whom believed that they were still fighing fascism (once embodied by the Nazis, and now embodied by the West) and others whom, it seemed, just couldn’t find a way to relinquish the power they had once held. It is written almost like a novel, with Funder taking us into the lives and minds of her interviewees so completely that I felt, at times, as though the ‘characters’ were fictional. Perhaps I was simply trying to convince myself they were, because I found it hard to deal with some of the events I read about in this book. It is not written simply as a recounting of conversations, or a cold transcription of interviews (though there are times when Funder does take us through personal encounters with some of the people who feature in the narrative), but we feel like we’re living these experiences with the people who suffered through them. It’s first-hand testimony, and it pulls no punches. The primary figure in the book is Miriam Weber, whose story begins when, at sixteen, she makes an attempt to flee east Germany, over the Berlin Wall, in order to reach the freedom of the west. She is found, and tortured by the Stasi, and eventually released into a world where she cannot find employment and where she is broken, mentally and physically, by her experience. Her name is on a list, and everywhere she goes, and every job she applies for, and everywhere she is asked for her name or her identity papers, she is met with walls of bureaucracy and stalling. She feels the clamp of the Stasi in every corner of her life. When she eventually marries her husband Charlie, the Stasi are not far away. Her husband is taken from her by the powers that be, and she never sees him again. Her quest to find out the truth of what happened to him runs through the entire narrative, and her quiet pain and rage seem, at times, to overwhelm her. We also learn about women whose relationships with men outside of east Germany are monitored (through letter interception and telephone tapping), and upon whom pressure is placed to bring the relationship to an end; we read several times of people who, for one reason or other, are on Stasi watchlists and who cannot find employment anywhere. At one point, one of Funder’s contacts arrives at an ‘Employment’ (as distinct to an ‘Unemployment’) office, and asks one of the other people there, conversationally, how long he has been unemployed. 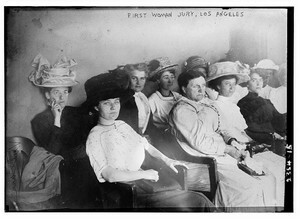 ‘Young lady,’ snaps an official. ‘You are not unemployed. You are seeking work.’ ‘I don’t see how it’s different,’ she retorts. ‘You are not unemployed! There is no unemployment in the German Democratic Republic!’ shrieks the official. We read of a raped woman who is forced to undergo a physical examination by a male police officer while naked on a table. I learned about Karl-Eduard von Schnitzler, who hosted a TV show (one of very few shown in the GDR) called Der Schwarze Kanal (The Black Channel), designed to mock and denigrate all that was western, and of other high-ranking Stasi officials whose homes were maintained like shrines to the old order. Several of the Stasi men mentioned in the narrative were still alive at the time Funder was writing, and it’s chilling – and fascinating – to read their take on what they were doing, and the state they were serving, and why they made the choices they did. Some stories were funny, like that of a former Stasi official who stole a plate from his office just before the Wall fell, and who lied repeatedly when police came looking for it. He took huge pleasure in showing Funder where he had it displayed, in pride of place, on his living-room wall, like a personal protest to a regime he had grown to hate. She also allows us glimpses into her own personal life, her fears and triumphs, her feelings at the loss of her beloved mother, the difficulties of writing a book such as this one. But the story which I will always remember is that of Frau Paul and her family, whose son Torsten was taken away into the west in order to receive life-saving medical treatment while a very young child (after having received ill-considered, careless treatment by doctors and nurses in the GDR). The Stasi, as was their wont, find a weakness in Frau Paul’s life and use it, cruelly, to try to force her to inform on a young man whom she knows will be put to death if she speaks out against him – and they tell her that if she does what they want, they will give her a pass to visit her child, whom she hasn’t seen for months on end. Her choice brought tears to my eyes. The most knowledge I had of the Stasi before reading this book was from watching the (excellent) film The Lives of Others; if you enjoyed that movie, Stasiland might be for you. It’s hard going, at times; it’s hard to believe, almost the whole way through. But it’s never anything less than brilliantly written, compelling, and deeply moving. It’s highly recommended. This entry was posted in Book Reviews and tagged Anna Funder, Berlin, Berlin Wall, book review, book review Saturday, east Berlin, German Democratic Republic, Germany in the late 20th Century, Miriam Weber, Stasi, Stasiland, west Berlin on March 28, 2015 by SJ O'Hart. At the end of last week, and into the weekend, I felt pretty rough. Tired, and washed-out, and hardly fit to string a sentence together. It felt, more or less, like I’d been squashed flat. Not a lot of fun. However, it did have one upside, and that was this: I finally got time to watch a few old episodes of BBC’s Sherlock, which (I hate to admit) I haven’t been following right from the start. I’d only seen series three up to last Saturday, and one of my Christmas presents to myself was the box set, which includes every episode so far. So, over Saturday and Sunday I settled in with series 1. And it was good. Now, there’s plenty to like about Sherlock. The cracking dialogue, and the excellent characters, and the clever plots (and, if you’ve got any familiarity with Arthur Conan Doyle’s original novels, the little references and nods, here and there, to the stories as they were originally written), and Mrs Hudson (who is just the best), and sweet, awkward Molly, and the deliciously unhinged Moriarty. Not to mention, of course, the main attraction. 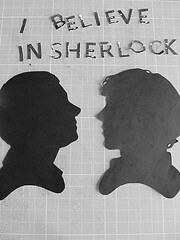 Every time you clap your hands, Sherlock and John get a new case! Whoever cast Benedict Cumberbatch as Sherlock and Martin Freeman as Dr John Watson needs a knighthood (or damehood, or whatever). Their dynamic is perfect, and their acting superb, and just… yeah. I’m fangirling now, so I’d better rein it in. Anyway. All of this is leading to a point, I promise. During one of the episodes, Sherlock (not a man who chooses his words with anything less than precise, elegant care) drops ‘meretricious’ into a conversation about a recently discovered corpse. In surprise, Inspector Lestrade replies ‘and a happy New Year’, looking a bit confused. I laughed at that, not just because of the funny dialogue, but because of the sheer wonder of the word ‘meretricious.’ I repeated it out loud to myself a few times (which probably means it was lucky I was alone), enjoying the sound, and spent a few moments being glad that I’m a person to whom words are important. Meretricious. Try it. You might find you enjoy saying it as much as I do. You may even find cause to use it in a sentence today, despite the fact that ‘tawdry’ or ‘tacky’ would do very well in its place. They just don’t sound the same. You can’t help but admire a character who uses a word like ‘meretricious’ in a sentence without even thinking about it, can you? As a kid, I was often told I’d swallowed a dictionary, because a word with fourteen syllables would always be my first choice (despite the fact that a word with three syllables, which meant just the same thing, would have done equally well); I also had the classic reader’s problem of mispronouncing things, because I’d only ever seen them written down. I really admire a character who is written in a way which appeals to my vocabulary-loving heart, and it got me thinking about some of my other favourite words. Mellifluous. A rich, honeyed, pleasingly musical sound. Zaftig. A German borrowing, meaning ‘curvaceous and attractive.’ This word was used of me, once, before I knew what it meant, meaning I had to make a quick judgement call as to whether it was an insult or not. (It wasn’t). Sometimes I wonder whether my ignorance had a role to play in the way my life has subsequently developed. Oh, well. No harm. Palimpsest. A manuscript which bears the faint traces of other, earlier words, either words which have been erased and written over or words which were impressed or embossed upon the parchment through a heavy-handed scribe leaning on another sheet. Propinquity. A tendency, inclination, or attraction, or the nearness of things to one another. There are many more, but here I must draw a line for fear of instilling boredom. I’m struck, while compiling this list, how many words I love the sound of begin with the letter ‘p’ and/or end in some version of an ‘s’. Strange, and inexplicable, and rather interesting – at least, to me. Words in all their loveliness please my nerdy little heart. I’ve often meant to compile a proper list of my favourites, and keep adding to it as I learn more – but that’s a job of work for another day, I feel. Do you have a favourite word, or a Top 10? Frankly, I’ll be less inclined to like you if you don’t. Just saying. This entry was posted in Musings and tagged Arthur Conan Doyle, beauty of words, Benedict Cumberbatch, best words in the English language, collection of favourite words, favourite words, Martin Freeman, Moriarty, Sherlock, words on March 23, 2015 by SJ O'Hart. I can’t let Terry Pratchett’s death pass without looking at one of his masterful Discworld novels, particularly this one, which I love. (Well, I love them all… but you know what I mean). 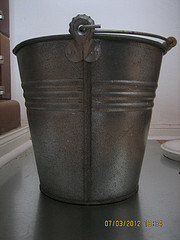 Image: taken by SJ O’Hart. While I was at university studying to complete my PhD, I loaned my original copy of Lords and Ladies to my doctoral supervisor. Cutting a long story short, I never got it back – not because it vanished into the pestilential pit of his office, but because he loved it so much that persuaded me to give it to him as a gift. There was actual eyelash-fluttering involved (and he did buy me a beer to sort-of make up for it), so I had very little hope of withstanding. I relinquished the book, and that was that. For several years – almost a decade, in fact – my Pratchett collection had a hole, right in the middle. Then, one day, my beloved came home with a small, paper-wrapped package in his hand, which he gave to me without a word. I opened it, and the wonderful red-coloured cover in the photo above came into view. The book I now have is a different edition to the one I gave away, but it hardly matters. 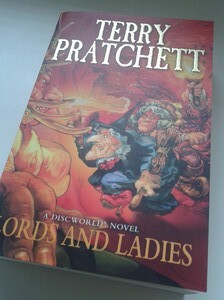 My favourite Discworld novel had returned, and I was delighted to welcome it. Lords and Ladies is a book about the collision between worlds – as so many Discworld books are, in some form or other – and this collision happens in a lot of ways. On the most basic level we have the world of the Disc coming into contact with the world of the Gentry (or the Shining Ones, or the Fair Folk, or – of course – the Lords and Ladies), as the Elves, the baddies of the piece, have come to be referred to over the years that have passed between their last appearance and the present time. These are not the gentle, wise Elves of Tolkien, by the way; we are not in Lothlorien, here. These are Elves of an entirely different breed. We also have the collision between the ‘old’ and ‘new’ styles of magic, embodied in Granny Weatherwax and Nanny Ogg (who are as old-school as it’s possible to be) who come face-to-face with Perdita (real name: Agnes) and her friends, whose naivety has given them corrupted ideas about the magic they wield. Their ‘new-fangledness’ has led them to dabble in things they do not have the experience to understand, and it is through their attempts to work magic without first learning what it is that the world is left open to the influence of evil. We also have Magrat, the third and youngest of the witches, who leaves behind her magical life (sort of, at least) in order to marry Verence, King of Lancre, a man who began his career as a Fool, and the book explores the relationship between king and people, nobility and commoner, and man and woman, all through their gentle, awkward relationship. In fact, I think part of the reason I love this book so much is because we have a chance to see Magrat as she is, not through the lens of being the ‘third witch’; we see her learning how to defend herself and those she loves against terrifying odds through her own ingenuity and bravery, and not through her magic. But it’s the story wot matters, and here it is. in the countryside of Lancre, there is a circle of standing stones known as the Dancers. Birds divert their course so as not to fly over it; clouds separate and flow around the circle, rejoining again once they’re past it. The weather inside the circle is different to the weather outside it. Once, the stones were guarded and feared, and the grass around them was kept short, and people stayed away. But time passed, and the fear began to dissipate. 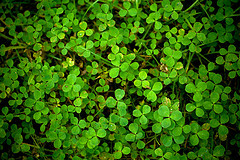 The grass grew. The old stories were forgotten. Young, unschooled witches begin to have their sabbats around the stones, and careless hunters disturb it by driving animals, against their will, into the gaps between the Dancers. If something goes in, then something must also come out… In this way, the power of the Gentry is awoken, and the Elves finally manage to find the crack in the world which they have long been searching for. It is up to Granny Weatherwax and Nanny Ogg, as well as a brave band of Morris Men, to send them back where they came from. For these Elves are not benevolent, or kind, or interested in being guardians or custodians of mankind. Their power is not on the wane. They are cold, and treat humanity as though it were a bug beneath a magnifying lens, and they love to cause pain just to watch what happens. They rejoice in their own power. Over the years, people have forgotten the cold and the cruelty, and remember only their beauty and the glamour they shroud themselves in, and nobody fears them any more – nobody but the witches, at least. Everything about this book is a triumph, from the wizards of the Unseen University and their cross-country trip to attend the wedding of King Verence and Ms Magrat Garlick (and the adventures which ensue), to the courtship of Nanny Ogg by Casanunda, the Disc’s second-greatest lover, to Granny Weatherwax’s secret past, to the legend of Queen Ynci whose fearsome iron armour becomes a useful weapon against the Elves. There are scenes which make the reader snort with laughter (like the Stick-and-Bucket dance, or the moment when Verence takes delivery of what he thinks is a guide to ‘marital arts’, but turns out to be something quite different), and there are scenes which chill the blood, and there are scenes which bring tears to the reader’s eyes because they’re so real and moving. And, of course, on every page there are sentences so perfect that you just sigh in admiration as you read. Every Discworld novel has something to recommend it, and every fan of the series will have their own particular favourite – this is mine. If you haven’t already found yours, I hope you’ll read and re-read the books until you do. This entry was posted in Book Reviews and tagged book review, book review Saturday, Discworld, elves, Granny Weatherwax, Lords and Ladies, Magrat Garlick, Nanny Ogg, Terry Pratchett, The Gentry, Unseen University on March 21, 2015 by SJ O'Hart.